Tristan Slater, vaulting with the Capital City Striders is now the 2013 15-16 boys United States AAU Pole Vault Champion taking 1st place at the AAU Junior Olympics at Olds-Marshall Track in Rynearson Stadium on the campus of Eastern Michigan University in Ypsilanti, Michigan. In the Boys’ 15-16 year old division Nathan Stout , a rising sophomore from Gilmer County High School, won a national title in the shot put with a toss of 48'02" and placed 4th in the discus event at the AAU Junior Olympic Games held in Ypsilanti, Michigan at Eastern Michigan University. 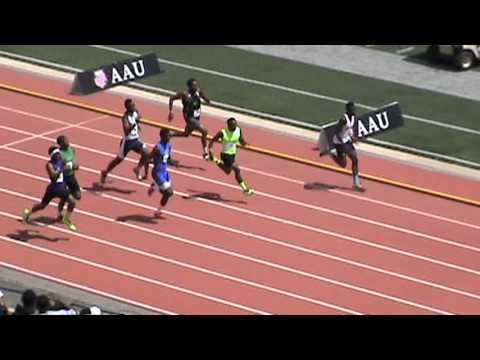 Highlights of performances by Virginians at the 2013 AAU Junior Olympic Games beng held between July 28th and August 3rd at Eastern Michigan University in Ypsilanti, Michigan.